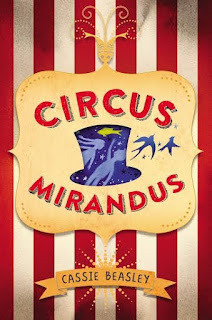 Today I'm celebrating the release of CIRCUS MIRANDUS by Cassie Beasley (Dial). I haven't yet read it, but I want to, which is why I am taking part in this blog blast! More details about the book are below, as well as a Rafflecopter giveaway for a bunch of swag items, courtesy of Penguin Young Readers! Enter for a chance to win at the bottom of this post. "Micah Tuttle believes in magic, even though his awful Great-Aunt Gertrudis doesn’t approve. Micah believes in the stories his dying Grandpa Ephraim tells him of the magical Circus Mirandus: the invisible tiger guarding the gates, the beautiful flying birdwoman, and the magician more powerful than any other—the Man Who Bends Light. Finally, Grandpa Ephraim offers proof. The Circus is real—and the Lightbender owes Ephraim a miracle. With his friend Jenny Mendoza in tow, Micah sets out to find the Circus and the man he believes will save his grandfather. The only problem is, the Lightbender doesn't want to keep his promise. And now it's up to Micah to get the miracle he came for. Readers will fall in love with CIRCUS MIRANDUS, which celebrates the power of seeing magic in the world." I've really looking forward to this one. It looks so much fun! My boys are going to love it in a few years time.